The ATO has passed legislation that, from 1st January 2017, Working Holiday Makers are entitled to a 15% tax rate for earnings up to $37,000 per year. 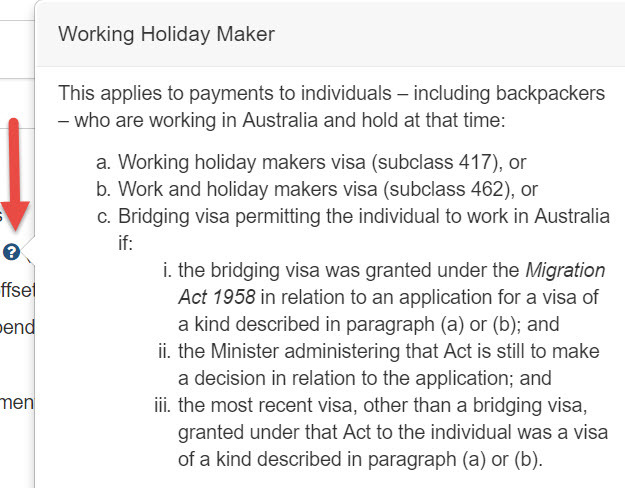 Please note that the business is also required to register once with the ATO as an employer of working holiday makers before they are entitled to this new tax rate. Please note that The ATO does not require the submission of a new tax file declaration for this change. Once the declaration is saved, the employee will receive the new PAYG rates for any pay runs with a date paid on-or-after 1st January 2017. For pay runs with a date paid before 1/1/2017, the tax will be calculated according to the standard non-resident tax tables. This means that you can set up the employees prior to 1/1/2017 and the appropriate tax rules will be applied based on the date paid. The ATO legislation has specified that for working holiday makers that were employed prior to 1st January 2017, 2 payment summaries will be required at the end of financial year – one for work up to 1st January 2017 and one for work after that date. Please note that the necessary payment summary changes will NOT be available for 1st January but it will be available early in the new year.